I’ve discovered that I’m a bit of a pancake snob. It didn’t happen overnight, but I think I can trace it back to the acquisition of a home grain mill. Milling wheat (or any other grain) to make your own flour has a dramatic impact on the healthfulness as well as the taste of the flour. I own a Mockmill and I highly recommend it (opinions are my own and I am not paid to express them). 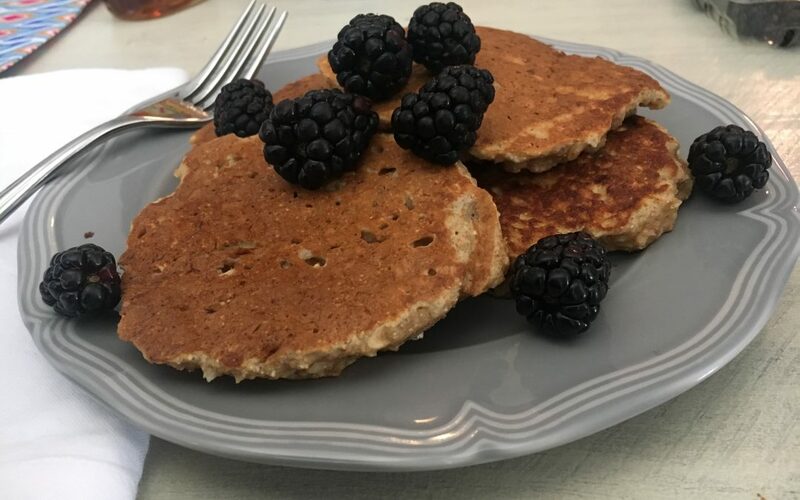 This recipe based off one I found on Bon Appetit, is particularly satisfying due to the cooked grains that are stirred into the batter and will not leave you feeling guilty and still hungry after devouring the entire stack. When I made these last week, I used quinoa but can see how it would be great to mix a couple different grains. Whisk whole wheat and gluten-free flours, coconut sugar, baking powder, baking soda, and salt in a large bowl. Whisk egg and non-dairy milk in a medium bowl just to incorporate. Using a few swift strokes, whisk egg mixture into dry ingredients just to combine. Stir grains into batter (you can pulse the grains in a food processor first if you prefer them in smaller pieces). Heat a large nonstick skillet over medium-high. Lightly brush with coconut oil. Add 1/4 cup scoop of batter for each pancake. Cook pancakes until bubbles have formed and broken across the entire surface and underside is golden brown. Flip pancake, cook until lightly browned underneath, about 1 minute. Transfer pancakes to a plate. Repeat with remaining batter. Serve pancakes topped with fruit and syrup.